Update Friday: showers likely but heavy showers & thunderstorms unlikely Saturday as upper air temps rise and build pressure rapidly during the day inhibiting convection. Warming uppers means lower lapse rates, less perky convection, thermals rise less vigorously and less high and so cumulus clouds build less height. A classic intensifying COLD FRONT passing over Reigate on Friday 26 April is set to bring some heavy rain and then a chillier feel to the weather after temperatures soared to over 22ºC today. Reigate has been bathed in warm Tropical air brought by south westerly winds this week and night time temperatures have barely fallen below 10ºC. The arrival of cold polar air is set to push maximum temperatures below 12ºC during the day over the weekend, so it will feel decidedly less balmy. 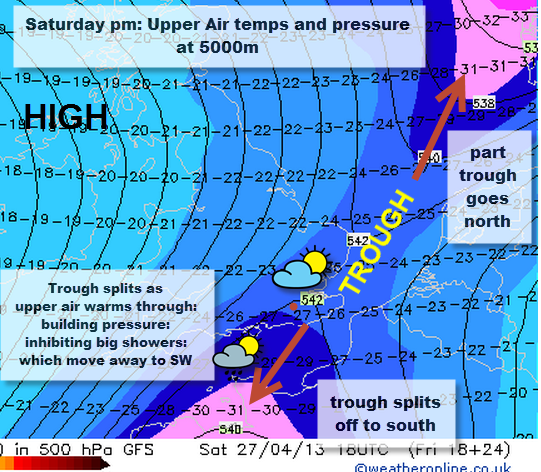 Expect a cool, bright and showery weekend with cold nights and a frost risk. Sunday looks dry and bright with light winds, so this will be a pleasant day. So Polar air is not all bad news with sparkling visibility as well as possibly some splendid cumulonimbus or cumulus congestus clouds on Saturday! This typical cold front, albeit initially lacking in perky thunderstorms, shows how relatively dense cold Polar Maritime air advancing into warmer Tropical Maritime air still hanging on in the SE over Reigate causes moderate to heavy rainfall. The warmer, less dense, Tropical air mass has temperatures at 1500m (5000 feet) of +8ºC. The advancing cold Polar airmass from the North has upper air temperatures of -5ºC and this air will push the warmer air up. Rising air containing moisture condenses, forming clouds and rain. The more rapid and vigorous the lift, the more condensation takes place and the heavier the rain. Reigate can expect moderate to heavy rain in the morning as the cold air undercuts the warm. Rising air also causes atmospheric pressure to fall and this occurs in advance of COLD fronts. There is often a rapid RISE in air pressure as cold fronts move away and this often leads to skies clearing and a temporary lull in showery activity before surfaces warm, lapse rates and instability increase and cumulonimbus clouds form bringing heavy showers. Saturday has a heightened risk of heavy thundery showers arriving on the northerly wind in easterly building belts of convective clouds: some big cumulonimbus clouds are possible. Belts of moving showers moving down a trough on northerly winds are called “scoopers”. 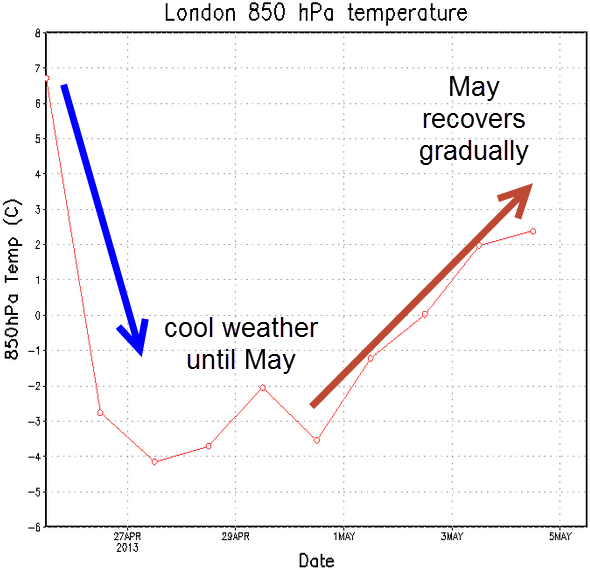 This cooler snap looks fairly short lived with a gradual recovery to warmer temperatures in early May with a HIGH pressure predicted on some models, so possibly a dry and bright bank holiday! Check back for updates.